I'm a collector of "stuff". I love trinkets, vintage cameras, art prints, teacups and anything personalized. The more creative and unique, the better! I'm also a huge fan of stamped spoons. I've been collecting them for years. Their handmade nature makes them perfectly unique and personal. They look beautiful in the kitchen, make for fantastic gifts and are always a hit when my friends see them served with a cup of tea or coffee. Bon Vivant Design House is giving away a custom spoon to one lucky winner! 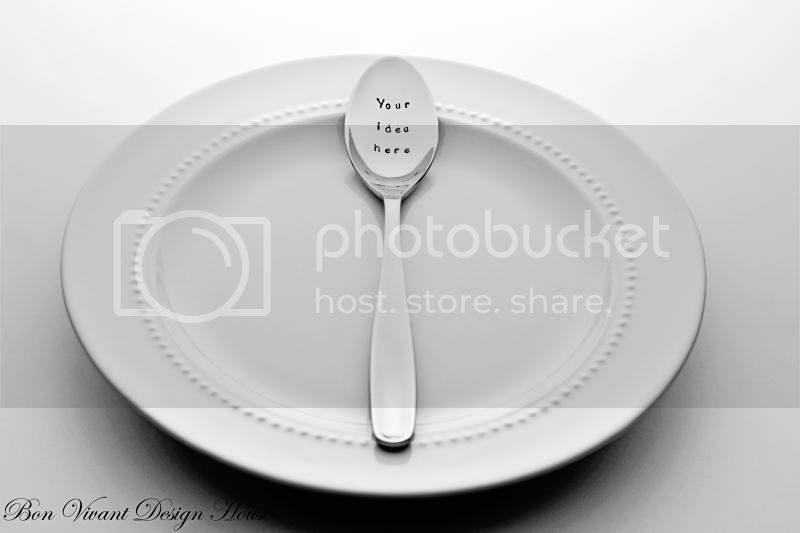 The winner can choose whatever text they'd like, so long as it can fit on the spoon. For a chance to win your very own custom spoon, please leave a comment below letting us know what your custom idea is (mandatory)! Purchase a stamped spoon, stamped fork, stamped butter spreader or vintage necklace from Bon Vivant Design House for 5 additional entries! How pretty! I might choose to write: "Lagniappe Love"
I think I would choose, "We love you Daddy". I added Bon Vivant Design House to my favourites, and they are! Etsy name is nicolthe pickle. I like Bon Vivant Design House on facebook as nicole graham. I follow Bon Vivant Design on pinterest as well as nicolthe pickle. I follow you on etsy as nicolthe pickle. I follow you on pinterest as nicolthe pickle. I like you on facebook as Nicole Graham. Oh LOVE these!! I would inscribe it with my "our family saying"... "love you the most!" I would like "Accio Food" or "I aim to misbehave." I favorited Bon Vivant Design House on Etsy as alionandalamb. My custom idea is "Friends". This would be a gift for my beautiful daughter,she is my inspiration. I think it'd be a cool idea to write 'Lick me!' on the spoon. There are many things I would like to put on the spoon - I'd like to have my monogram with my wedding date. Or maybe just the word "Love"
I'd love to have "Always and Forever" or maybe the initials of my children. I would like it to say "Let's Spoon"
I would write "this is a spoon"
Our family does not have any custom ideas. It would simply say "Julianne"
I'd put "Sweet As My Sugar Lump"
I would put "DEElish" because my nickname is Dee and of course the food I like to consume is always delicious. I favorited Bon Vivant Design on Etsy as deebelievesinyou. I favorited Haute Whimsy on Etsy as deebelievesinyou. I follow Bon Vivant Design House on Pinterest as stonefoxdee. I follow Jen Harbourn on Pinterest as stonefoxdee. also, I deleted my last comment because of a typo. whoops! A special birthday spoon for whoever the birthday kid is that says "Happy Birthday to me!" My custom idea would be to put this on a spoon "Love is space and time measured by the heart". I would love to have "Always" on the spoon! I'd love to put my family's names on the spoons. I'd love a spoon with "Matthew 4:4" engraved on it. I think it'd be very fitting! I would love to have these for my 16 grandchildren. I would put a bible verse on it. Example: Proverbs 4:23. This would make them curious to know what the verse says & eventually, they would remember the verses on the spoons in their house! I would have it say "Frank & Chavonne"
I think mine would say: I love cake. I saw a spoon once that said Cereal Killer on it and thought it was hysterical! I would Always on one spoon and Forever on another spoon as part of a matching set. I love this idea I have no idea what I would like on it maybe a baby's name. I would put something like "Let's eat" or maybe my initials (VMV). I follow Haute Whimsy on Facebook.